Developed for the iPad and iPhone, Avatar Secrets is an interactive documentary that is now also available as a 10 episode web series on Vimeo. The immersive media format of Avatar Secrets uses an innovative multi-layered 2.5D interface allowing users to follow an engaging linear storyline, or guide their own explorations as they travel through an interactive cinematic experience which bridges the virtual world, the real world, and the space in between. With real-world, live-action video footage and captivating case studies, integrated into beautiful animated sequences, Avatar Secrets chronicles writer/director Ramona Pringle’s own life changing virtual experiences and perceptions. Ramona’s journey is presented with intersecting axes of narratives: the dilemma of disconnection; the empathic promise of the virtual frontier; and commentary and wisdom from context-sensitive world experts. 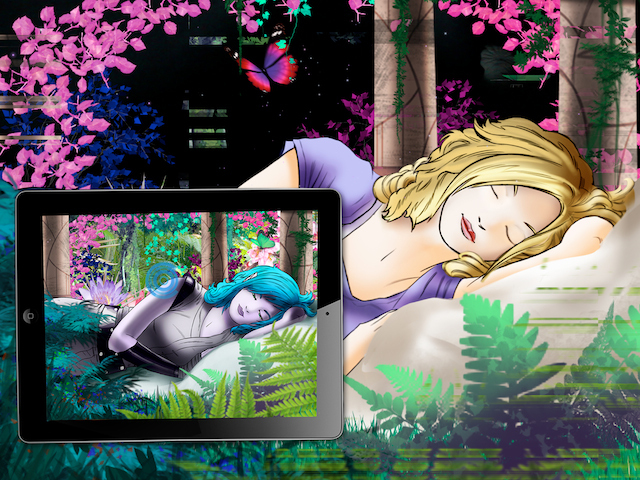 Benefitting from the touch screen capabilities of the iPad, Avatar Secrets creates an immersive narrative experience for the viewer. For maximum emotional effect, the “A story” is told as a linear narrative in which the audience follows Ramona’s POV journey, but broken into self contained chapters, and layered with interactive features and additional rich content including video commentaries, extended sequences, and expert interview clips. User experience borrows from games and interactive graphic novels, and integrates common tablet user interaction for an intuitive experience, such as screen taps and swipes. While there is a “how to navigate” tutorial that is accessible by clicking on the upper navigation within the iPad, the user interface is minimal and interaction is designed to be easy and intuitive. Avatar Secrets is written and directed by Ramona Pringle. Creative direction by Michaele Jordana (Cyborg: The Human Condition, The Mystery of San Nicandro) with animation by Olney Atwell (NBC, Discovery Channel, Adult Swim) and illustration by Michael Derrah.